A real tussle between the government and the opposition is gaining momentum as the wind of revolt that is currently shaking the Arab world continues. Following the Tunisian and Egyptian popular revolts, a demonstration for "change in the system" is expected to take place in several Algerian cities Saturday despite a ban on any such gatherings. Algeria is holding its breath. Saturday’s demonstration, announced by the new Coordination Nationale pour le Changement et la Démocratie (CNCD — National Coordination for Change and Democracy), expected to take place in Algiers and several other cities, will go ahead, notwithstanding a ban on any such demonstrations by the Algerian authorities. How will the government react? Will the masses join the protests? This will a real test for both the government and opposition. Formed on January 21 in the wake of a protest march against the high cost of living, which left 5 people dead and over 800 injured, CNCD is seeking a systemic "change" in Algeria. With 70 per cent of the Northern African country’s population under 30 years, the massive youth unemployment that has hit Algeria amid high level corruption and widespread poverty could give impetus to the planned protests. The protest march comes at a time when an unprecedented wave of revolt continues to shake the foundations of autocratic governments in the Arab world. Algerian writer and academic, Fodil Boumal, one of CNCD’s founding members says that the group has largely been "encouraged" in its "peaceful approach" by the revolutions of Tunisia and Egypt. Meanwhile, gripped by fear of contagion after the Tunisian revolt, which caused the collapse of Zine El Abidine Ben Ali regime as well as the Egyptian popular uprising, the Algerian government has increased its promises of openness in recent days. President Bouteflika, who has been in power since 1999, announced on February 3 that a state of emergency, imposed in 1992, would be removed. He also stated that television and radio would "ensure an equal coverage of all approved national parties". Algerian authorities have nevertheless been doing all in their power to prevent Saturday’s protest. Some 30,000 policemen have been dispatched to several wilayas (provinces) across the country, according to Al-Khabar newspaper. The Wali (provincial administrator) of Algiers, Mohamed Kebir Addou, Tuesday, February 8, met with several local officials to prepare an anti-protest strategy, TSA-Algérie, an online newspaper, reported. 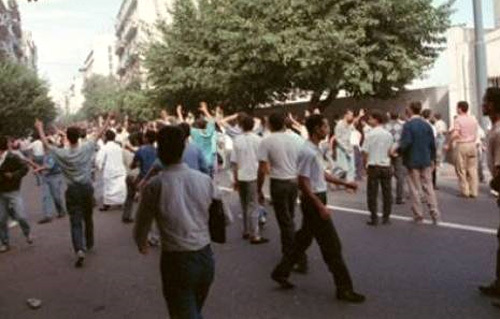 The meeting’s objective was to prevent the protest by deploying an extraordinary number of policemen around la place du 1er Mai, where the protestors are expected to converge, and Bab El Oued, another sensitive neighborhood, where riots over the country’s high cost of living erupted early this year. A massive police deployment is also planned in other cities. These include Boumerdes, Bejaia and Tizi Ouzou. And despite a ban on demonstrations in Oran, CNCD says the protest will take place. Thursday, local activists of the largest city in the western part of Algeria handed out leaflets in schools, universities, shops, cafés, among others, asking people to gather at Place du 1er Novembre, the City Hall square, to demand change and democracy. That same day, three student members of the Algerian League for the Defense of Human Rights (LADDH) were arrested by the police for distributing leaflets in downtown Oran, Algérie-Focus reported. Former soldiers claiming a better pension, the unemployed gathering in front of the Ministry of Labour to demand jobs, students, teachers, lecturers and professors denouncing unsuitable programmes, employees from various sectors demanding higher wages with about 100 000 medical personnel already on an indefinite strike: Algeria is on the brink as strikes, protests and immolations grow at a breakneck pace. "The wall of fear has collapsed", says Faisal Métaoui, an analysts who writes for El Watan, an Algerian weekly.